The test covers the determination of consolidated drained shear strength of a soil material by direct shear. 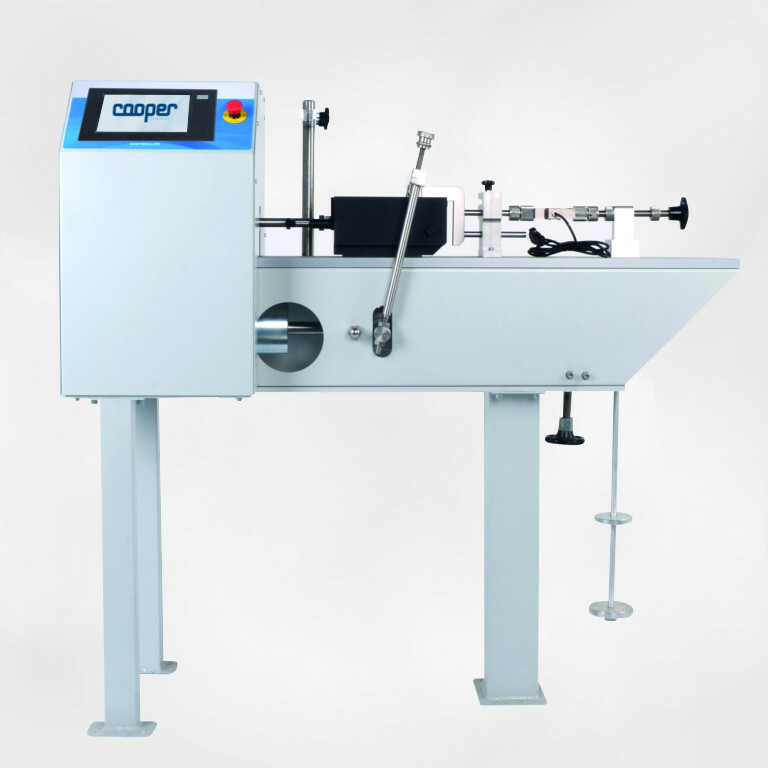 TS-2060 Automatic Direct – Residual Shear Test Machine is motorized and floor mounted. Normal stress is applied to the specimen by utilising a weight hanger, a lever arm (amplification ratios of 9:1, 10:1 and 11:1), and a vertical loading yoke. Hanger can receive up to 50 kg of weight which is amplified by the lever arm and transferred to the specimen by the vertical loading yoke as a normal force up to 5 kN (5000 N). The machine is supplied with a shearbox bowl that accepts 60 mm square, 100 mm square, 60 mm dia. round, 100 mm dia. round and 2.5 inc. dia. round shearboxes. Shearbox bowl is designed to contain water to inundate the specimen during the test. The shearbox assemblies consist of rigid upper and lower shearbox frames with lifting and locking screws, a grooved loading pad, a grooved base plate, porous plates (2 pcs. ), and perforated plates (2 pcs.). Drive unit utilises a high resolution servomotor and a gear box assembly to ensure continuously variable transmission of speed in a range from 0.00001 mm-min. to 15 mm-min for both forward and reverse directions. 5 kN load cell is used for load measurement. 10 x 0.001 mm and 25 x 0.001 mm sensitivity linear potentiometric transducers are used for vertical and horizontal displacement measurements respectively. Displacement limits are controlled by limit switch. Shearbox Assemblies, Slotted Weight Set and other optional accessories including cutting ring and extrusion dolly should be ordered separately. The vertical displacement value can be tared prior to recording. 3 different shearing test types can be selected. (HOME) position, waits for the dissipation of excess pore pressure and starts to the same procedure again. User can create testing scenarios by determining all the parameters of this multi-reversal shearing test such as test speed, return speed, displacement target, standby time, and cycle number. Cooper Direct and Residual Shear Software is developed in accordance with ASTM D3080, BS 1377:7 and AASHTO T 236 standards to be used with TS-2060 Machine. Direct residual and shear software consist of two sections. First section is used for the consolidation of the sample prior to shear. The second section of the software is capable of performing three different types of test. The first type of the tests is to move moves the machine with the speed determined by user until a load shear failure happens occurs. On the second type, of test the user can set a speed and a horizontal displacement and the test will continue until the machine reaches to the set value. On the last type of test, the machine can be configured for cyclic (multireversal) operation. In cyclic mode device will advance to the determined distance with an assigned speed and turn back to the initial (home) position with a different assigned speed, wait for a time for the dissipation of excess pore pressure and start to the new cycle again. going to a set horizontal displacement value with the speed determined by user and return to opposite direction with same speed until the home position. And also the number of cycles,forward-reverse speeds and displacement for the measurement of residual share may also be programmed. All these test parameters such as forward-reverse speed, distance, cycle number, etc. can be defined by the user. The software supports 5 different normal load values in order to calculate cohesion (C) and internal friction angle (Ø) values. Prior to the test normal load value must be entered to the software. The normal stress value would be is calculated according to normal load and sample size automatically. The software supports both square type and round type samples. For both samples the area might be calculated by directly or by using the net area caused by horizontal displacement. The net area method is especially important for critical samples on academic literature. Stress values can be optionally and automatically calculated as “standard area” and the “corrected area” approach. When the test is completed max peak and resilient residual stress values are recorded. The normal load versus max peak stress pair is used for calculating the calculation of the cohesion and internal friction angle value and angle. At least 3 loading with different normal loads are required for this property. One can set test speed, axis values etc. through the setup of the software. The results can be submitted as a report or can be exported to Microsoft Excel for advanced reanalyse procedures. Accessories are not included in the price of main device (unless stated otherwise) and may be purchased separately if required.